A member of the Central Military Commission. Education: Joined the PLA at the age of 16 and served in the Army Rocket Force (formerly called the Second Artillery Corps) – China’s nuclear arsenal. Career: Long career in the Army Rocket Force, briefly interrupted by serving as Deputy Chief of Staff on the PLA General Staff Department (2010-2012). 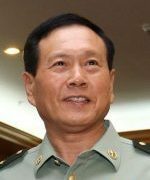 Was the first Army Officer promoted to General by Xi Jinping; in 2012 General Wei became Commander of the Army Rocket Force. Prospects: Member of the Central Military Commission since 2017. Named Minister of Defence and a State Councilor in 2018, suggesting a high level of confidence from Xi Jinping. OR: State Council Information Office. No.225 Changyangmennei Dajie, Dongcheng District, Beijing, 100010.